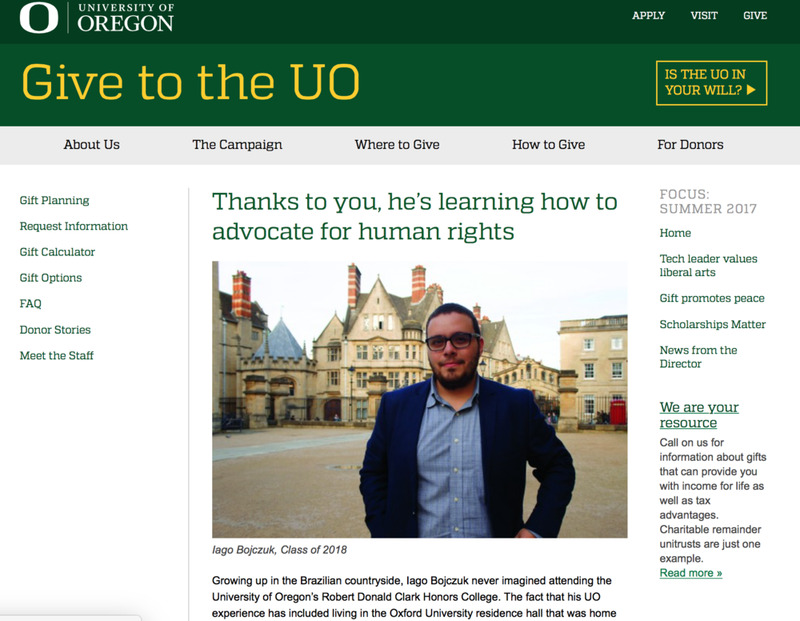 First-generation college student Iago Bojczuk came a long way to study at the UO School of Journalism and Communication. Here are a few things the Brazilian-born media studies alum shared about his time at the SOJC, how it helped him plot his course to grad school at MIT and where he’s bound for next. 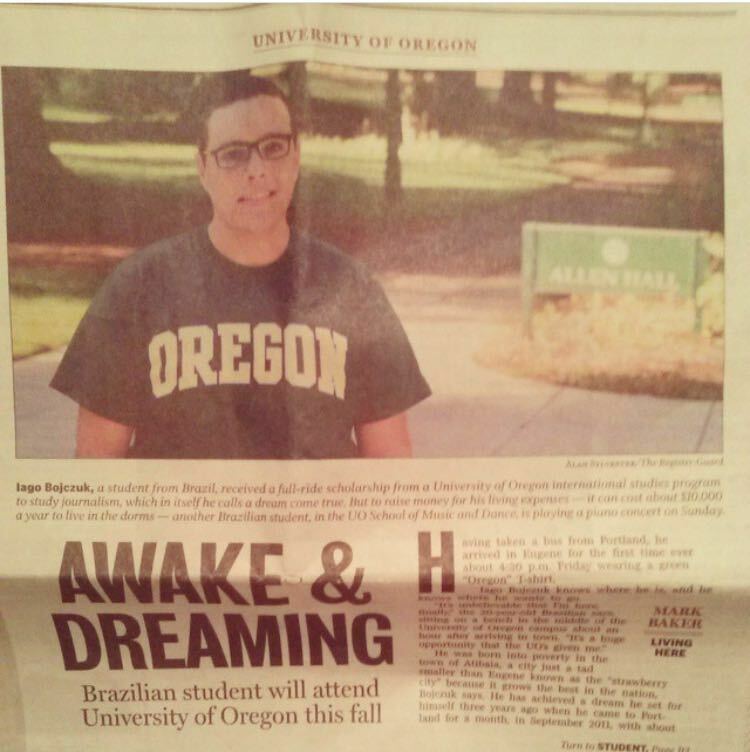 Awake and Dreaming: Brazilian student will attend the UO in the fall. He was born into poverty in the town of Atibaia, a city just a tad smaller than Eugene known as the "strawberry city" because it grows the best in the nation, Bojczuk says. He has achieved a dream he set for himself three years ago when he came to Portland for a month, in September 2011, with about 30 other top high school students from the Brazilian state of Sao Paulo. Iago Bojczuk, from Atibaia, São Paulo, Brazil, is the first student in the ICSP to receive acceptance from four out of five highly prestigious universities to pursue his graduate degree. He will be graduating from the University of Oregon on June 18, 2018, with three honors degrees. Há cinco anos, depois de voltar de um intercâmbio cultural nos EUA patrocinado pelo Governo do Estado de São Paulo, o estudante Iago Bojczuk estabeleceu uma meta que parecia impossível de se realizar na época: estudar em uma universidade americana. Depois da primeira tentativa frustrada de conseguir uma bolsa integral no exterior, ele conseguiu aprovação em mais de sete universidades públicas no Brasil e se matriculou duas vezes na USP, antes de deixar o país. Iago is from Atibaia, countryside of the State of São Paulo, Brazil. Being the first member of his family pursuing a university degree, he never thought that one day he could study in another country notwithstanding that he is from a low-income background. He managed himself to go from poorly educated to highly qualified academically, motivated on a personal level, and with a keen sense of social responsibility. Iago foi escolhido em um grupo de 700 jovens de todo o mundo para representar o Brasil em um evento importante chamado Preparando Líderes Globais, que será daqui algumas semanas na Jordânia. As the first in his family to attend college, Iago Bojczuk never expected to leave his countryside town in Brazil to travel to the United States for higher education. Now a sophomore at the University of Oregon (UO) School of Journalism and Communication (SOJC) studying journalism, Bojczuk is well on his way to becoming an innovative young leader. This month, Bojczuk — who is also a full-tuition scholarship recipient in the Clarks Honor College — will be heading to the Harvard Innovation Lab in Boston, Massachusetts, to attend the Hive Global Leaders Program. Aluno da FEA-RP/USP Iago Bojczuk viajou para Amã, na Jordânia, para participar da Preparing Global Leaders Academy, programa educacional de estratégia internacional que reúne os melhores estudantes e jovens profissionais de todo o mundo e cuja missão é treinar novas lideranças de forma eficaz e ética a fim de resolver problemas relacionados à educação, saúde e tecnologia. Conheça a história do Iago na matéria dele para o programa que ele irá participar em Harvard. O Iago também está presente no e-book ''Vidas Que Inspiram'' do Universitários Acima da Média. With over 24,000 students at the University of Oregon, multiple students have been selected by their peers, professors and University of Oregon staff for the opportunity to win the prize of being a 25 Duck. The award is bestowed upon individuals who show impressive leadership, innovation and passion, and after a month-long nomination period, a panel of students and professionals from the Alumni Center and the Emerald Media Group selected 25 students to represent each year’s winners. International Perspectives is a radio show hosted by Lily Cox-Skall and Layla Kanaan, exploring international cultures through interviews with students at the University of Oregon. O livro conta 29 histórias de jovens acima da média que estão sendo os autores/protagonistas da sua própria história de vida, criando seu legado. O aluno fez parte do processo de seleção do Intercâmbio Cultural do Centro Paula Souza, parceria de incentivo educacional feita com o Governo do Estado de São Paulo, e foi contemplado com uma bolsa de estudo concedida para os 250 melhores alunos das Faculdades de Tecnologia do Estado de São Paulo - Fatec’s, ou Escolas Técnicas Estaduais- Etec’s.